MAP was selected as a winner and Best in Show in this year’s Fierce Innovation Awards for its population health and patient engagement solutions for behavioral health. MAP Health Management, LLC., announced today that is has been selected as a winner in this year’s Fierce Innovation Awards: Healthcare Edition 2017, an awards program from the publisher of FierceHealthcare. 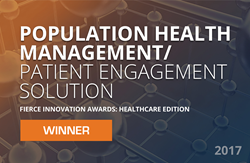 MAP was recognized as a winner in the category of Population Health Management/Patient Engagement Solutions, as well as Best in Show for “Fiercest Engagement Solution”. MAP was selected as a winner for its innovative, industry leading population health and patient engagement solutions for Substance Use Disorder and behavioral health. Winners were selected by a distinguished panel of judges from renowned U.S. hospitals and healthcare systems. The panel included Terry Booker, VP Corporate and Business Development, Independence Blue Cross (IBC); Roy DeLaMar, Internal Business Communications Manager, Cigna; Neal Ganguly, VP and CIO, JFK Health System; Deborah Gordon, VP Marketing Sales and Product Strategy, Tufts Health Plan; Jessica Grosset, VC of IT, Infrastructure and Operation, Mayo Clinic; Kurt Cwak, CIO, Proliance Surgeons; Roger Neal, CIO and VP, Information Technology, Duncan Regional Hospital; Todd Richardson, Senior VP/CIO, Aspirus; Edward Ricks, VP and CIO, Information Services, Beaufort Memorial Hospital; and Julie Slezak, EVP, Clinical Analytics, GNS Healthcare. All applications were evaluated based on the following criteria: Competitive Advantage, Financial Impact/Value, Market Need, and Overall Innovation. Applicants with the top 3 scores in each category were selected as finalists. “MAP is honored to be a winner for this award and takes great pride in our mission to improve outcomes for the millions of people and families struggling with addictions and co-occurring behavioral health disorders,” said Jacob Levenson, Founder and CEO of MAP Health Management. To learn more about MAP, visit https://www.thisismap.com. MAP develops technology-enabled solutions that improve clinical and financial outcomes for chronic behavioral health disorders such as Substance Use Disorder. MAP empowers treatment providers, health insurance companies, health systems, and patients with the right data at the right time to improve clinical and financial outcomes. For more information, visit https://www.thisismap.com.